When I go on holi-yays or visit somewhere new, the eating and drinking is one of my favourite things to do. It’s a veritable edible adventure. Did you catch the post where I shared the 7 Best Breakfasts and Coffees in Hobart? That had my mornings and afternoon coffee fix covered! 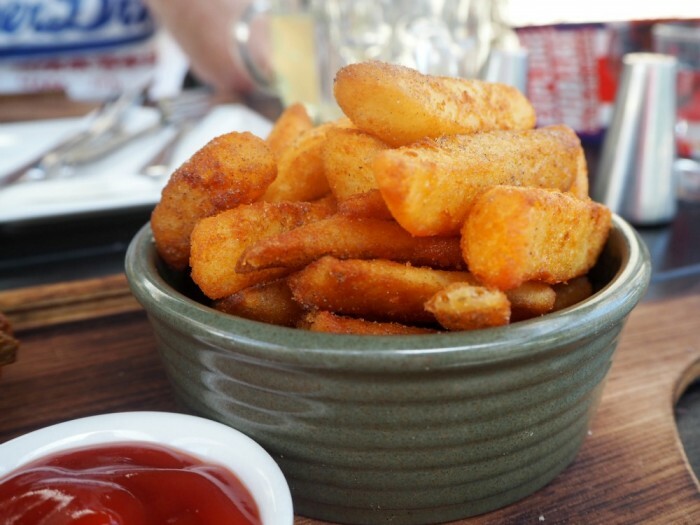 Today I’m stepping things up a gear with 7 great places to eat and drink and I promise you, Hobart will not disappoint! Let’s get this party started! 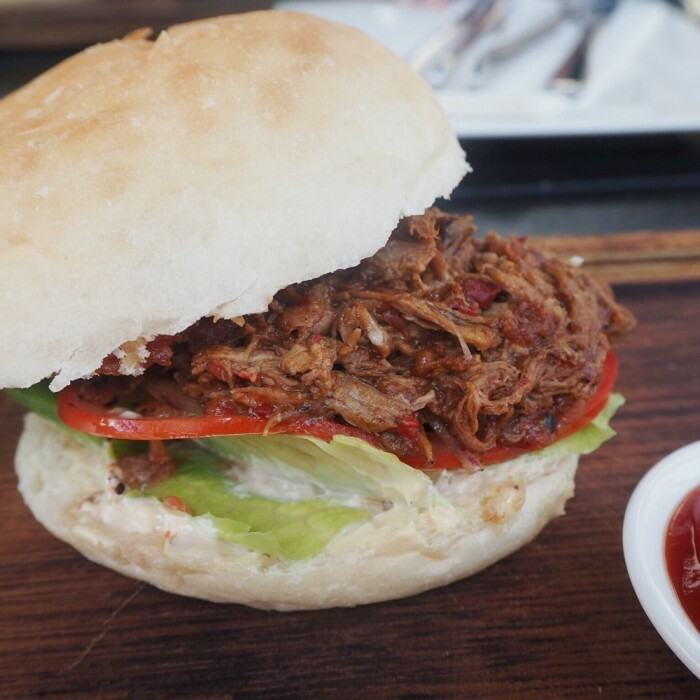 Burger Haus is one of our first and favourite Hobart foodie finds. 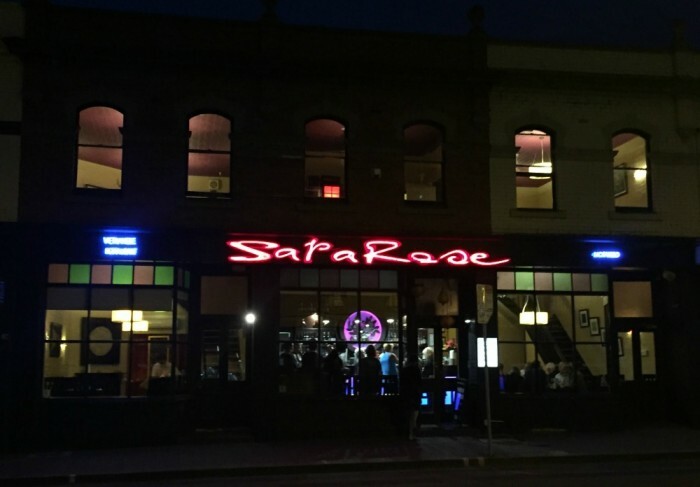 Located in a quirky laneway in North Hobart it’s fun, retro, super relaxed and has more burgers than you can shake a stick at. Produce is locally sourced, all burgers are made in haus and the burgers are big, really big. Make sure you come hungry! 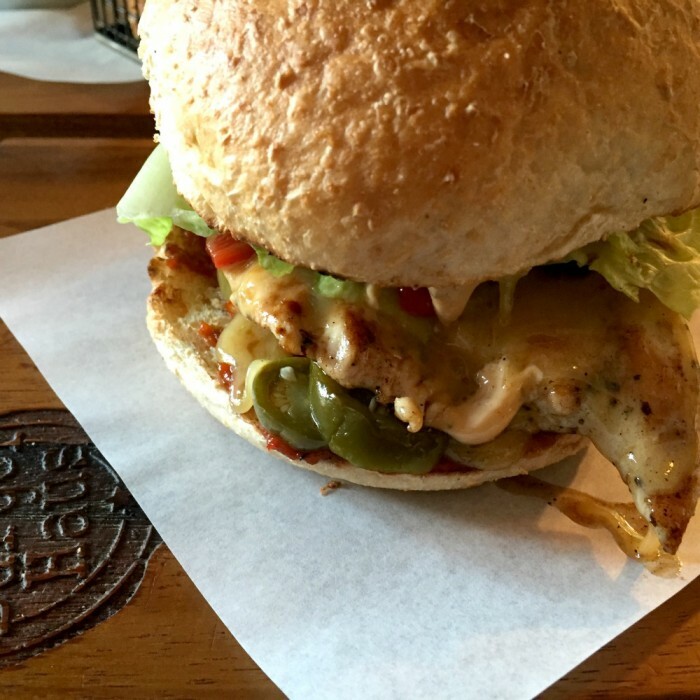 Here’s the Hot Haus (also $13) – 100% chicken breast, tasty cheese, sweet chilli jam, haus made aioli, jalapenos, avocado and roasted capsicum. It’s a beast, but a delicious beast at that. 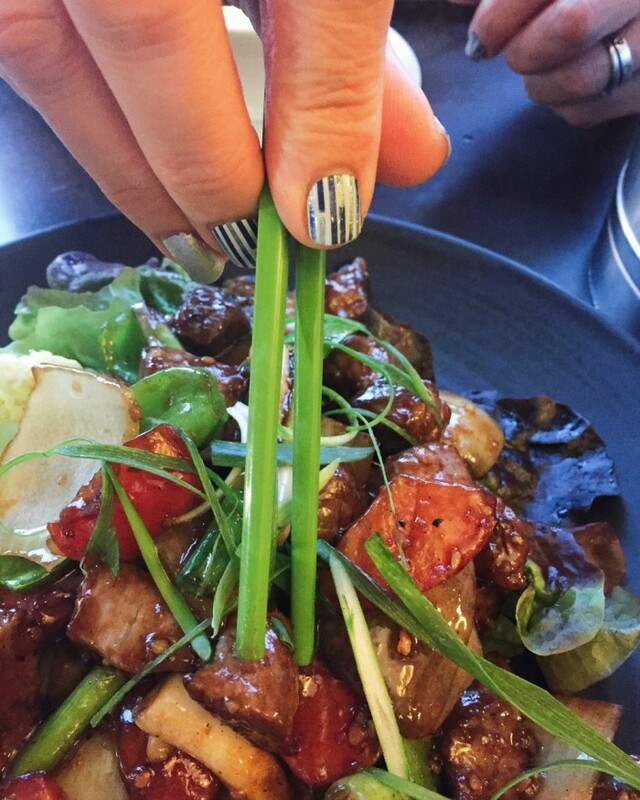 The menu is divided into beef, chicken, lamb and vegetarian burgers and there are heaps of gluten free choices too. Some burgers can be made vegan and the kids meals look so good, adults will experience a severe case of food envy. The sides that come out of the kitchen all look so tasty, it’s difficult to de-side (Ha! See what I did there?) 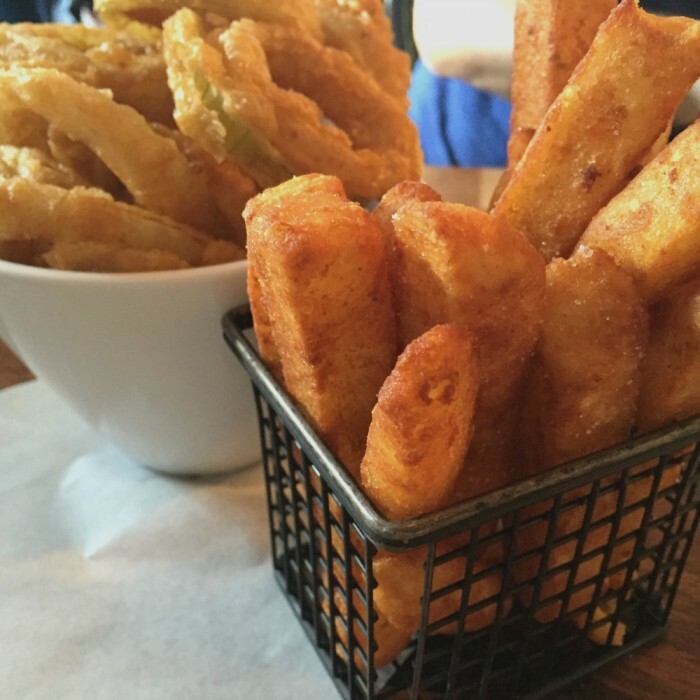 In the end we narrow it down to the Beer Battered Chips ($4.5) and the Haus Onion Rings ($5.5) and we aren’t disappointed. We are however, full to bursting point! I consider myself a bit of a self- appointed Onion Ring Expert and these are some of the best I have ever tasted. Deliciously light and crisp on the outside, and soft, melty onion on the inside. These babies are hard to beat. 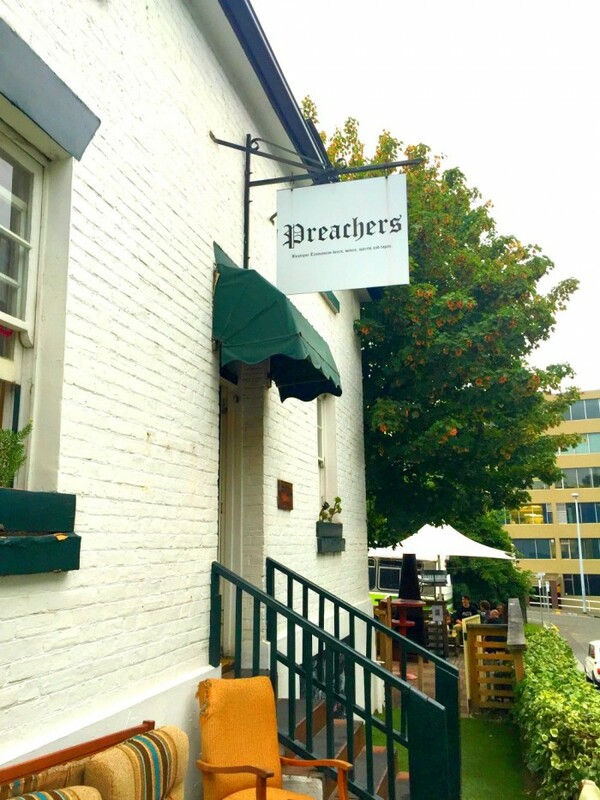 There’s a sunny terrace plus indoor seating and great views of Mount Wellington from just about wherever you sit. You can’t beat this place for good vibes, great burgers and fabulous value. There are no reservations at the Haus but if it’s too busy and you don’t have time to wait, grab a takeaway and take enjoy the haus at home. 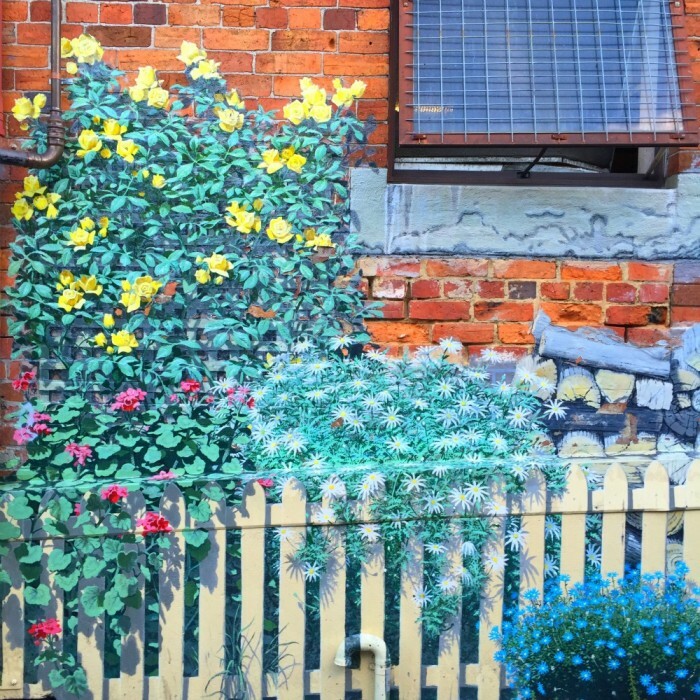 Oh and one last thing, don’t forget to check out the street art down the lane! Our verdict: The box ticker – great food, great vibe, great value. When I asked the peeps on Facebook where to go and what to eat in Hobart, Michelle told me that fish and chips from the place that serves it in the brown paper cones is a must. This is the place that serves it’s chips and just about everything else in the humble brown paper cone and Michelle was right, it’s definitely worth a visit. I’m not sure that this place lives up to it’s claim of serving the best fish and chips in Australia, but it certainly has some of the best views. 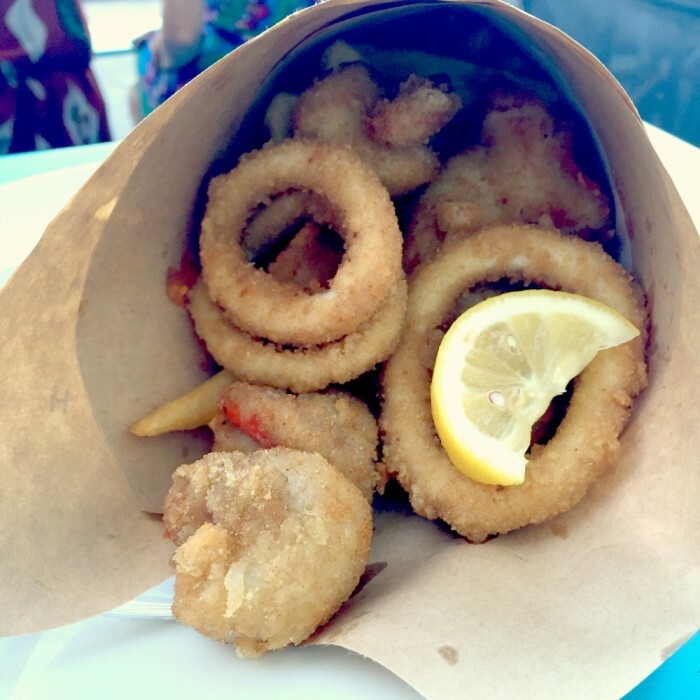 We can’t choose just one item, so we go for the Fish Frenzy ($21) two pieces of crumbed fish, scallops, calamari and chips, and yes, you guessed it, it all comes served in a brown paper cone! The scallops and fish are our favourite by far. This place gets super busy but the service is so quick, you won’t have to wait long for a table and they do take away too. 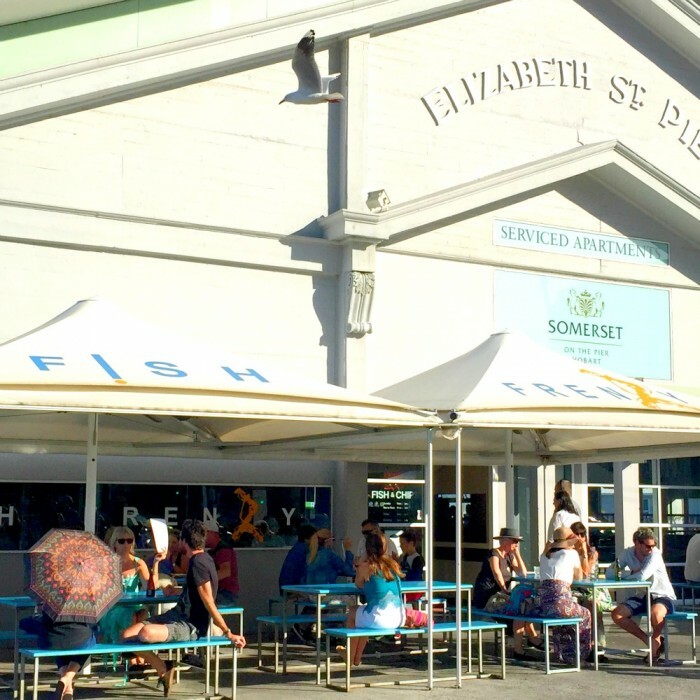 If you like fish and chips, casual dining and dinner with a view, this place is not to be missed! Our verdict: Fast fish with an awesome view. 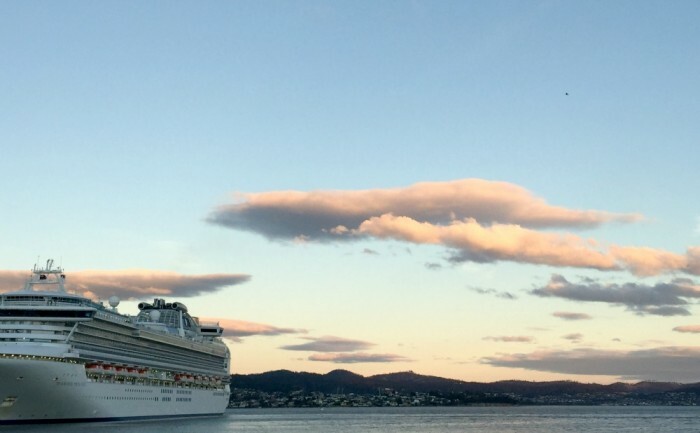 On our first day in Hobart, we take a stroll around Battery Point. Being naturally nosy, I peer in through the front windows and see the chefs making pasta by hand. This is one place I had to eat at. 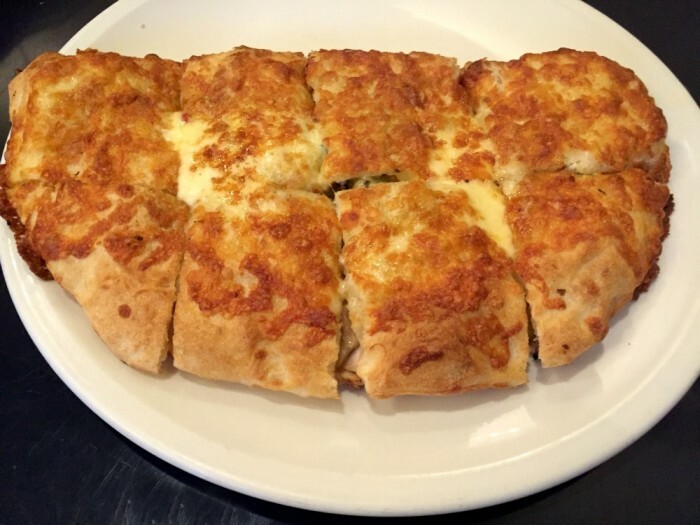 It turns out this well loved eatery has been serving an impressively long list of pizzas, pastas and veal and chicken dishes since 1994 and more than twenty years on, it’s still as popular as ever. The decor is not fancy but the welcome is warm and the service efficient and friendly. Our server takes great pride in telling us that Nonna still comes in every day to make the gnocchi and one of the co-owners Marco, comes over to greet us personally and to check if we like our meals. Actually, we don’t like the meals. We love them. There’s no starters to speak of here, so you just go belly first into the mains. I love my Primavera pizza but David’s Chicken Calzoni ($27 for a large size) is the star of the show. Packed full of chicken, capsicum, olives, mushrooms and sun dried tomatoes, he says it is the best Calzoni he’d ever eaten, and he should know because he’s eaten a lot of Calzoni. 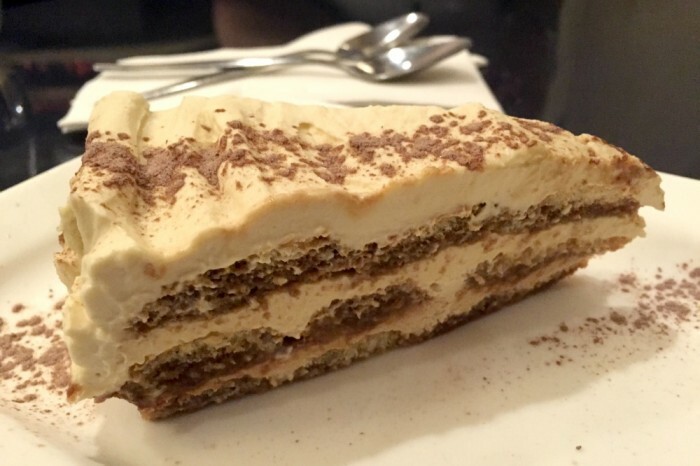 Hard as it may be, do try and save some stomach space because this is one serve of Tiramisu you don’t want to miss. This place is always busy, we went on a Tuesday night and the place was packed out, so book ahead to avoid disappointment. Or grab yourself a take away! Our verdict: An oldie but a goodie. Coincidentally, this is another reader recommendation and it turns out it is located just around the corner from our hotel. Every night we walk past this large, double fronted, two storey restaurant, it is packed, and (as we later discover) for good reason. We don’t eat a lot of Vietnamese food so I can’t vouch for it’s authenticity but the menu is vast with some cracking Asian flavours and something for everyone. Service is friendly and efficient, although the food does take a while to arrive at the table. 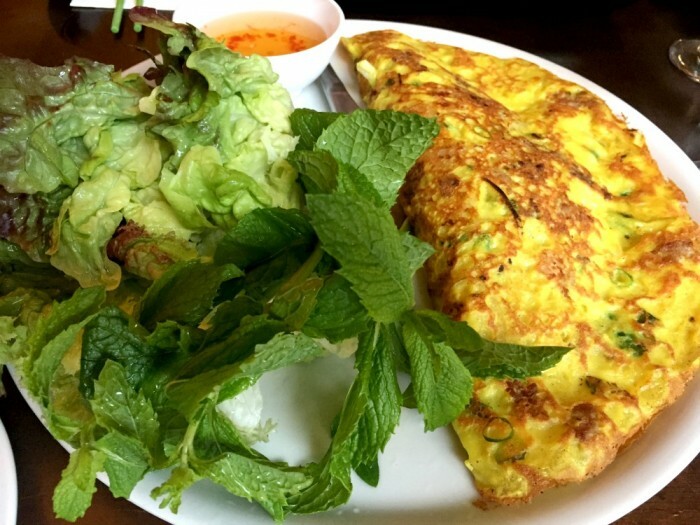 We pop our Saigon Pancake cherry ($17) and love it. Have you ever tried? Apparently this light crispy pancake stuffed with garlic prawns, pork, onion and bean shoots is a traditional dish of the Southern region of Vietnam. The pancake is eaten topped with fresh mint, wrapped in crisp lettuce leaves and then dipped in a fish sauce. I’d go back here just for the pancake. The Shaking Beef ($23) is another favourite. This dish of cubed Scotch fillet tossed with tomato, onion, ginger and black pepper is tender as, and full of flavour. We also try the 333 Braised Pork ($23) because who can resist pork belly? Not us, that’s for sure. The pork belly is braised in master stock, flavoured with 333 beer and literally melts in your mouth. It’s sublime! This place also does a roaring take away trade, but if you want to dine in, book ahead to avoid disappointment. Our verdict: Fresh and full Asian flavours. Well worth a visit. This place describes itself as a “European inspired tavern specialising in gourmet burgers and craft beer” and that kind of sums it up. It is a top spot for either a beer and/or a burger. With over 16 beers on tap from around Australia and New Zealand, and heaps more bottles besides, you’ll be spoilt for choice for drinks and the food menu isn’t half bad either. The range of burgers is vast, with a choice of beef, chicken, lamb, pork, fish, game and some delicious sounding vegetarian options. There are also sliders, share plates and gluten free buns. The burgers aren’t cheap here but they are delicious. The Beef and Bacon ($17) with Tasmanian grass fed beef, streaky bacon, heidi gruyere cheese, spanish onion, tomato, lettuce, beetroot, smoky barbecue sauce and garlic aioli is as big a feed as it sounds. I choose the Wallaby Burger ($17) for novelty value. The braised Tasmanian wallaby rump has the texture of pulled pork but a very gamey taste which I’m not sure I have acquired. It is served with lettuce, tomato, spanish onion and some pear and pepperberry chutney and garlic aioli which balances the gameyness (is that even a word?) of the wallaby meat nicely. The thick cut chips ($5) are the stuff chip dreams are made of. Crispy on the outside, with soft pillowy insides. The burgers can take a a while to arrive so grab yourself a spot outside and watch the world go by, or head indoors to the cool, dark olde worlde interior and stay cool. 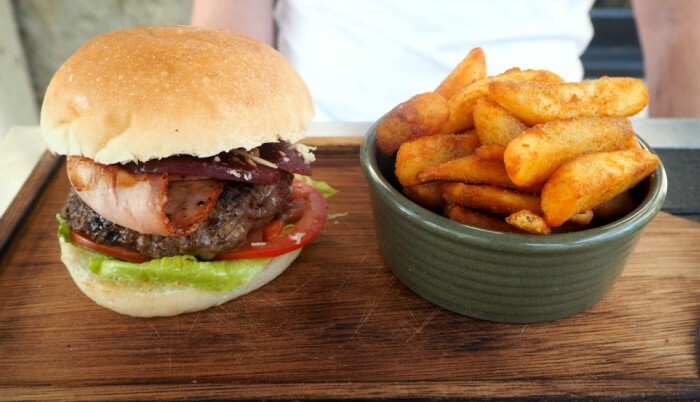 Our verdict: Posher than your average burger with a price tag to match. Sure you can take a pew on one of the retro sofas indoors, but the real magic at this place is in the eclectic beer garden where among the pre loved furniture you can find an old Hobart bus that is now full of beer booths! We don’t get time to eat here, but if we could have, we would, because everything that comes out of the kitchen looks seriously good. 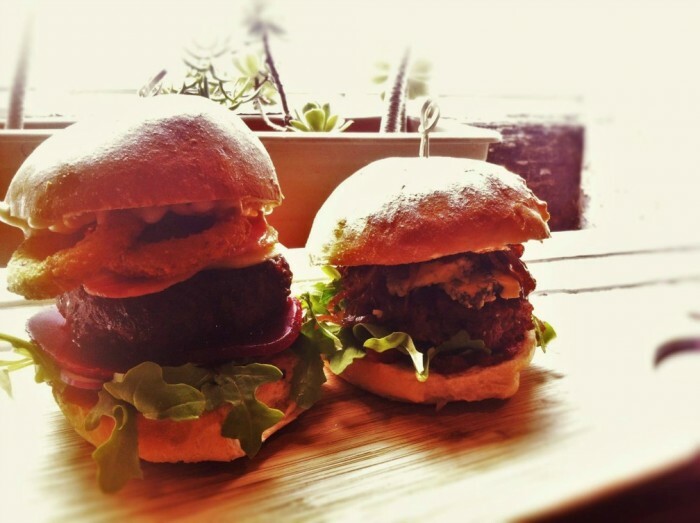 Take for example, these specials… Roo n’ Blue ($16) with a Skippy patty, “Roaring Forties” Blue, Rocket and Pepper Berry Relish and the Le Aussie ($19) -Beef patty, bacon, beetroot, onion Rrings, Ashgrove “Deloraine” Cheddar, onion, rocket, relish, aioli and mustard both of which are served with a side of beer battered fries. I feel hungry just thinking about it! This place has a heap of craft beers, a good wine list and a mouth watering menu of reasonably priced burgers, tapas and snacks. It’s a top spot! 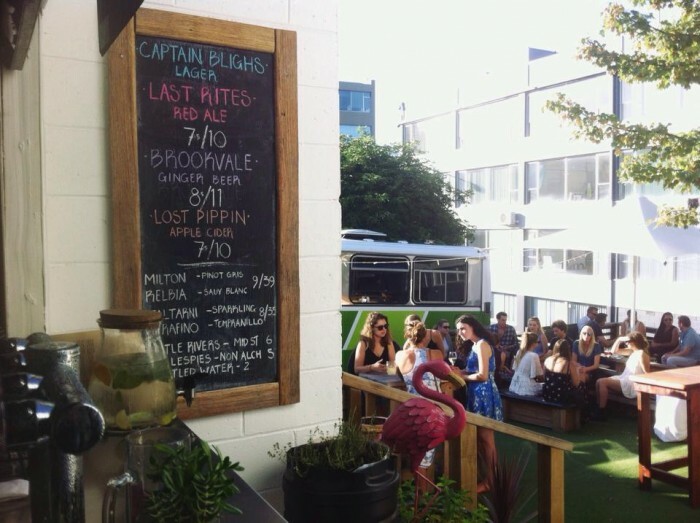 Our verdict: Bus + Beer Garden = Don’t miss it! 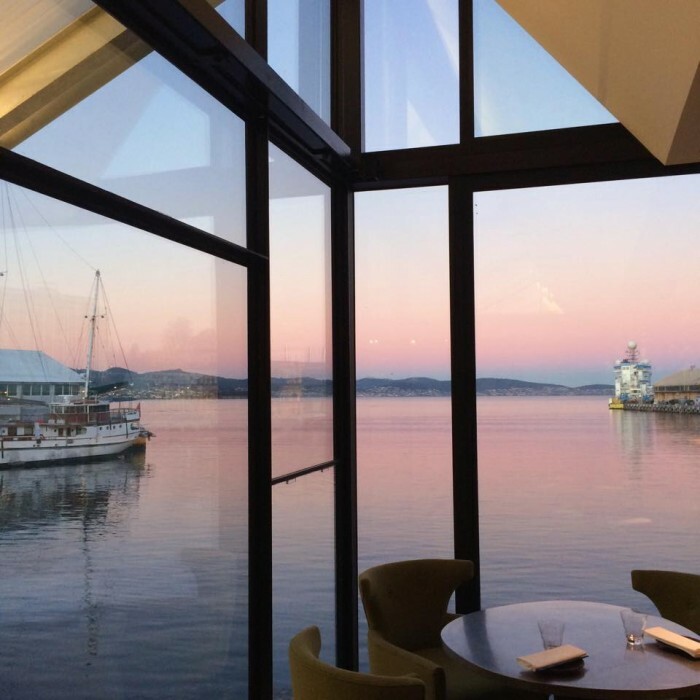 Located at the end of Brooke Street Pier, from where the MONA ferry departs, The Glass House is Hobart’s newest dining bar and what a wonderful addition it is too. There’s no outdoor seating, but that’s ok, because you can sit inside and enjoy the 280 degree water views. Everything about this place is fine, from the wine to the cocktails, the views to the food but although it’s posh, it’s not pretentious. 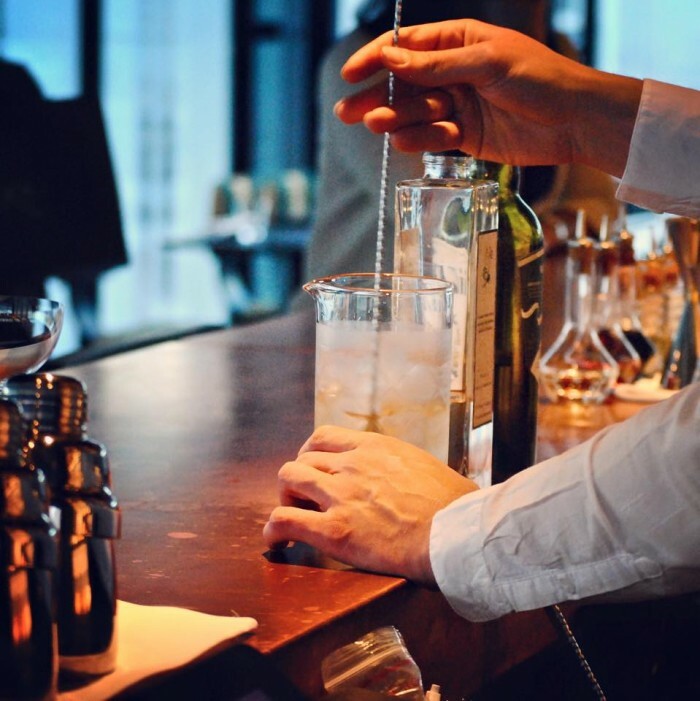 Even if like us, you don’t have time to dine here, you owe it to yourself to swing by for a drink. The cocktails are spectacular! Our favourites are the Pancake Sour (because bacon!) and the Pear Bear. 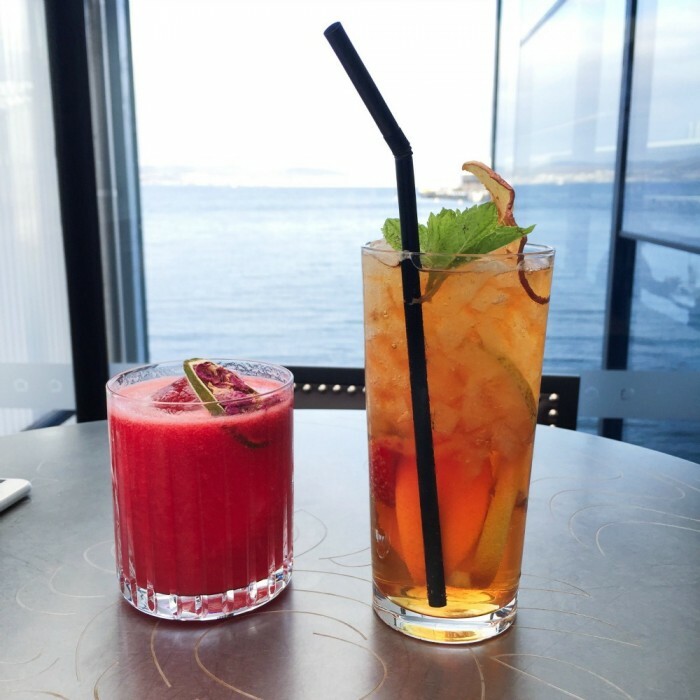 Our Verdict: Fantabulous cocktails with views to match. 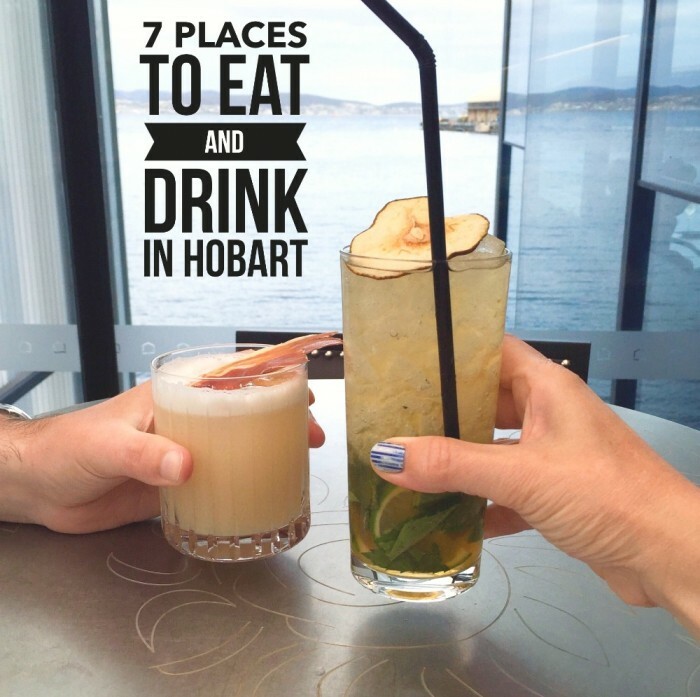 Have you got any Hobart eats or drinks to add to the list? Which one of these places would you pick? What’s your favourite thing to do on holi-yays? All food and drinks were independently paid for and all opinions are our own.